Schoolboy/Girl-98 - Michael Soler's place is 1st. Schoolboy/Girl-98 - Michael Soler's place is 3rd. Schoolboy/Girl-91-97 - Michael Soler's place is 1st. Entered my first Freestyle Tournament of the year. I went 5-0 on the day and scored 3 five point throws. 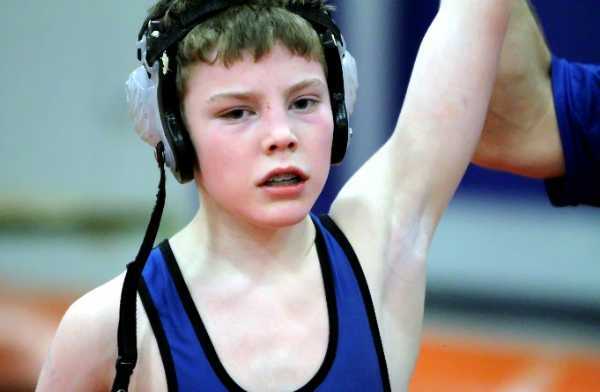 I decided to move down in weight from 98 to 91lbs at Folk style State to face my nemeses Tommy S. Tommy is one of the top wrestlers in the country in our age group. This is the fifth time I’ve faced him in the State Championship finals. I’ve only been able to beat him once. We had a tough battle but I came up short. I’ll keep working on getting better. I injury defaulted the finals match to my training partner Jake. He won the coin flip. Match #2 Michael Soler (Pin City Wrestling Club) received a bye. Schoolboy/Girl 98 - Michael Soler's place is 1st and has scored 9.00 team points. Hurt my thumb in my first match today and by the time I made it to the finals I couldn't wrestle so I injury defaulted to my training partner. Lost for the first time in a year today getting stuck in a suicide cradle not once but twice resulting in getting pinned. It was one year ago today at the same tournament that I lost the last time. I'll learn from it and get better. I ended up in 3rd for the 2nd year in a row. 9 to 12 Yrs. 97 - Michael Soler's place is 3rd and has scored 13.00 team points. Schoolboy/Girl 98 - Michael Soler's place is 1st and has scored 3.00 team points. 12 & Under 98 - Michael Soler's place is 1st and has scored 3.00 team points. Today I finished an Undefeated Novice age group season by winning the 2010 Freestyle State Championship. I also won the 2010 Triple Crown Championship by winning the Freestyle, Greco Roman and Folkstyle State Championships.Today I went un-scored on winning by 1 fall and 4 tech falls. Novice-95 - Michael Soler's place is 1st. Today I won The State Greco Roman State Championship for the third time, 8th overall state championship. I went 4-0 on the day taking first place. Novice-90-94 - MIchael Soler's place is 1st. Match #5 MIchael Soler (USA Everett) received a bye. I won the first freestyle tournament of the season going 3-0 on the day winning by tech fall in two of my matches and by fall in the third match. Novice-90 - Michael Soler's place is 1st. Novice 90-91.6 - Michael Soler's place is 1st and has scored 3.00 team points. Match #1 Michael Soler (USA Everett) received a bye. I took 1st today winning all three of my matches by fall or tech fall without giving up a point. I entered the annual Tough Guy Tournament the day after Thanksgiving. I started off great with 3 wins in row against school boy age group wrestlers putting me in the semis where I met Joe L. I've wrestle Joe every other year and have always been able to come away with the win. Today would be different. Joe wrestled a great match and got the win over me then went on to win the division. I continued on with 2 more wins to capture 3rd place. I went 5-1 on the day. The 2009 Folkstyle season has started. I'm wrestling as a 2nd year novice at 95lbs to start the season. I went 3-0 on the day scoring a fall and 2 tech falls to win the gold medal. Novice 90-94 - Michael Soler's place is 1st and has scored 3.00 team points. Today I ended my season by winning the Silver Medal at the 2009 Freestyle State Championships. I lost in the Championship match to Tanner B. After beating Tanner 4 straight times in freestyle prior to State. Tanner was able to defeat me twice today to win the Gold medal and me the Silver. I ended my season 4-4 against Tanner with an over all record of 54-7 with 20 wins by Fall and 23 wins by Tech Fall. Novice-85 - Michael Soler's place is 2nd. Match #3 Michael Soler (USA Everett Wrestling Club) received a bye. I lost my first Greco Roman match ever this weekend in the semi finals of the State Championships droping me to the Bronze Medal match which I won by fall. Novice-85 - Michael Soler's place is 3rd. Novice-85 - Michael Soler's place is 1st. Match #6 Michael Soler (USA Everett Wrestling Club) received a bye. Match #5 Michael Soler (USA Everett Wrestling Club) received a bye. I took first again today going 4-0 on the day with 1 fall and 2 tech falls. I had another tough match with Tanner B. I was able to come out on top for the 2nd week in a row by winning the 1st round 2-0 and second round 6-2 scoring 2-3 point throws. I also had a tough match with Brady A. He beat me in round 1 6-4 and took me out of my game. I was able to bounce back and won round 2 and 3 by tech fall. Today I won the Gold going 5-0 on the day with 2 falls, 2 tech falls and 1 on points in 3 rounds. 2 weeks ago I got stuck by Tanner B. This time I met Tanner in what would be the Gold medal match. I lost the first round to Tanner 4-0 in a hard fought round. In round 2 I was able to score a one point take down and held the lead through the round scoring another 2 point take down in the final seconds to win the round 3-0. In the deciding round I came out strong to dominate the round with a 11-3 tech to win the rematch with Tanner. I got back to my winning ways today going 3-0 on the day with 1 fall and 2 tech falls to win the Gold Medal. I had a rough start to the freestyle season today going 3-2 on the day and taking 4th place. 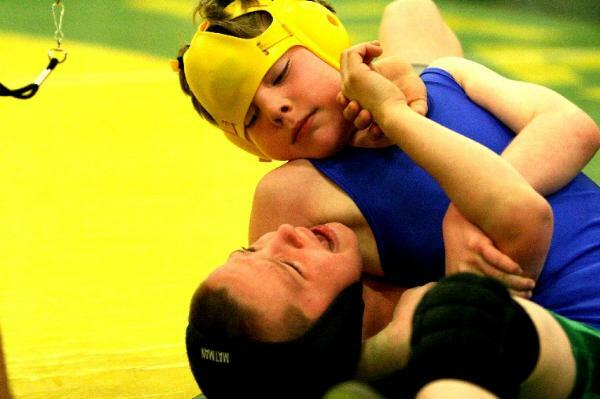 I lost my first match to Tanner B., a kid I defeated last season in the PCJWL Championships. He's a year older than me and won the folkstyle state championships a couple weeks ago. I also lost to Darrin H. latter in the day. 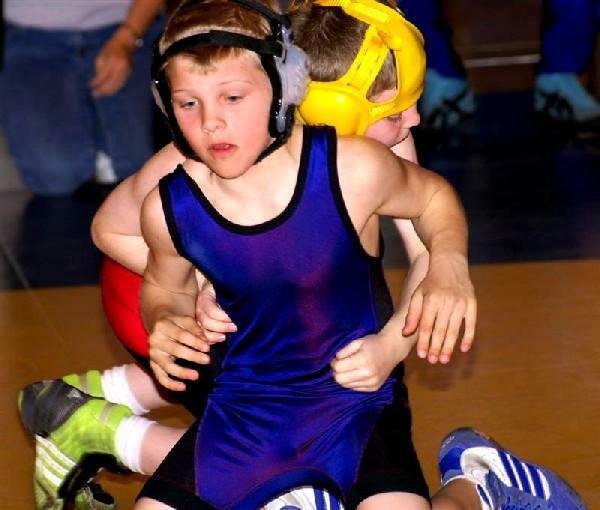 He's also a year older and had won the folkstyle state championships this year at his then weight. The rest of my matches I won by fall. I won the Silver Medal in the 2009 folkstyle state championship losing for the 3rd time in the past 4 years in the Folkstyle State Championship Finals to my nemesis Tommy S. I had a bye in the first round then scored a tech fall in round 2 followed by falls in rounds 3 and 4 putting me into the final vs Tommy. In the first period we battled back and forth with me scoring a take down mid way through the round, though the ref ruled it out of bounds. Tommy took down in round two with the score 0-0. I tried to break him down but he was able to score a stand up escape for 1. Thinking we were out of bounds I let up for a second and Tommy took advantage with a quick shot scoring a take down to go up 3-0. We reset in the middle of the mat with me on the bottom. I tried my patented shrug, which I have always been able to score with. This time, Tommy followed me well. He hooked my ankle with a cowboy ride; I made the mistake of still trying another shrug with my ankle hooked and my head down. Tommy took advantage driving me over my downed head into a stack for a fall, the first time I’ve given up a fall to someone in my own age group since I was 5. This year the 3rd place finisher was able to challenge for 2nd so I had one more match. I met Alius D. and defeated him 5-2 to hold on to the silver medal. I finished the folkstyle season with a 22-2 record. I went 3-0 on the day winning the Gold medal again. 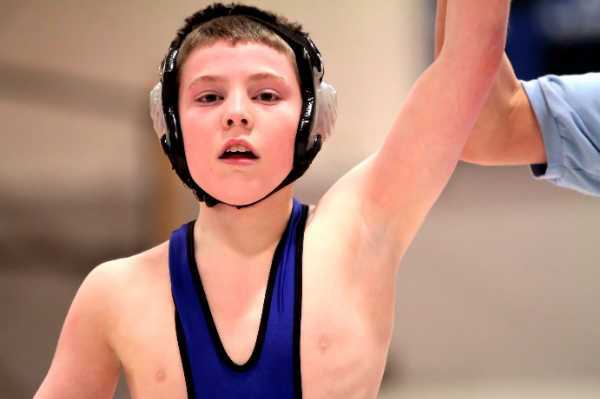 I renewed my rivary with Kyler P(above photo) today scoring a 7-3 victory in the 85lb bracket. I won my other matches 12-0 and 8-2. Next week is the state championships. I went 3-0 today to win the Gold medal. I scored a 9-1 win, a fall and a 6-0 win in the finals to improve my record to 15-1 on the year. Today I suffered my first loss in a regular season USA tournament in over 2 years. I didn't lose in my own weight class of 80lbs. My loss came moving up to the 85lb weight class to wrestle Bo L. I had a tough match with him in the finals after winning my first 2 matches,9-0 and 10-0. The match with Bo was 0-0 going into the final round. With seconds to go, I had a leg ride in that Bo was able to shake lose from to score a reveral for a 2-0 win(above photo). So I ended up with the silver medal. My record is now 12-1 on the year. I took 1st place again today going 3-0 on the day scoring 2 falls and a tech fall. The 2008/09 Folkstyle season started today. I won the Gold medal going 4-0 on the day. I had wins by 6-1, 10-0, Fall and Injury Default. For the 3rd straight year I went undefeated in the Freestyle and Greco Roman wrestling Seasons. Saturday I won my 3rd straight, 4th overall, Freestyle State Championship in dominate fashion. Four of my matches I won by fall and 1 match I won by tech fall without giving up a single point in any match. While going undefeated for the Freestyle and Greco Season, I did lose one match during the Folkstyle season. To Tommy S. in the State Folkstyle finals in OT. 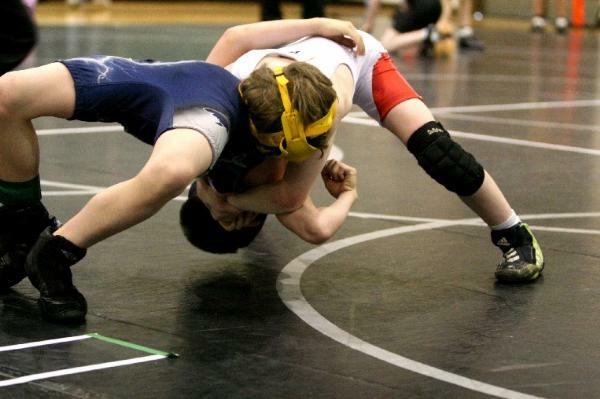 In my own age group I was 41-1 on the entire year scoring 26 falls and 14 tech falls. Only 1 of my wins went to decision. That match, a 2-0 4-0 win in freestyle against my training partner Issac. Over the last 3 years my record stands at 168-7, with all loses coming during the Folkstyle season. I have since revenged all those losses except for my loss this year to Tommy who I did not have the chance to wrestle since my loss. Today I took first place again going 4-0 on the day. I won my first two matches by tech fall and my third match by fall. I scored a 5 point throw today with a standing fireman's carry. In the finals I met my training partner Issac. I was able to come away with a hard fought win by decision in two rounds. Today I won my 2nd straight Greco Roman State Championship, my 5th State Wrestling Championship overall. I won two of my matches by fall and one by tech fall. I had a big bracket today and came away with 6 matches. I won three of those matches by fall and three by tech fall to take 1st place. I moved up in weight today to 80lbs. I only had one in my bracket and won that match by fall. 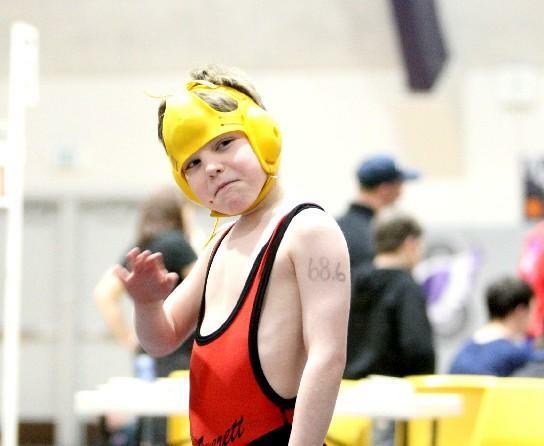 I did do two exhibition matches against kids from the next age group up. I won both of the matches, the first by tech and the second by fall. I won the Gold again today going 3-0 without giving up a single point. I won my first match by fall and my next two by tech fall. 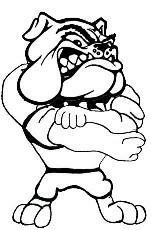 I moved up in weight this weekend wrestling at 80 lbs. I only had 2 matches, I won both. I scored a pin in my first match and won by tech fall in my second to take 1st place. Won the gold medal again today going 4-0 with 3 tech falls and a fall. 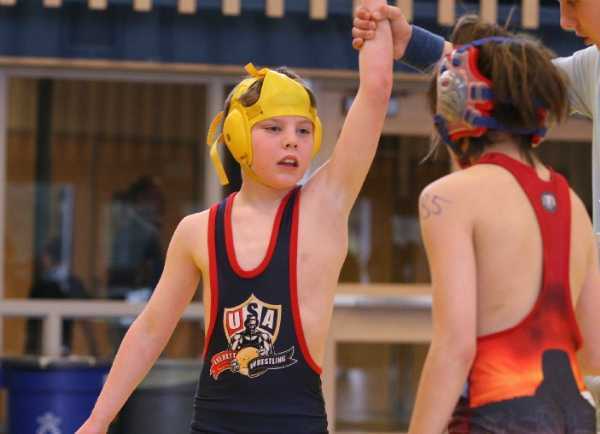 Today I entered the 1st Freestyle tournament of the Season. I won the Gold medal by scoring falls in all three of my matches without giving up a single point. 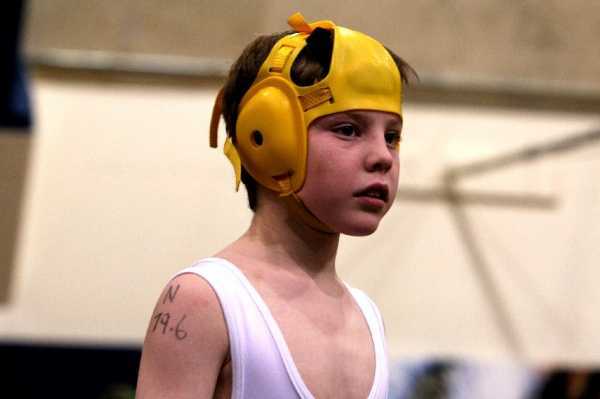 After wrestling in the PCJWL all folkstyle season against kids 3 years older than me, and winning against all but 2 wresters, I was really looking forward to the State championships where I would be wrestling kids my own age. I had a bye in round one then won my next three matches all by fall in less than 2 min each. 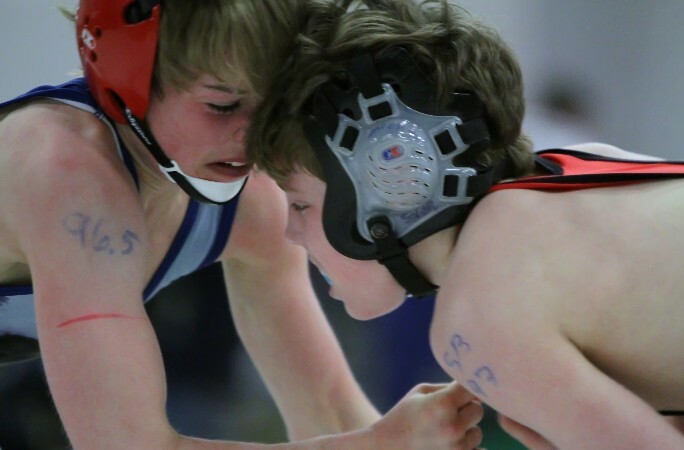 In the finals I was set to meet Tommy S. Tommy is a top-level wrestler who has won many national level tournaments that I compete against each year at the state championships, many times it is in the finals. This year was a real battle. We fought hard finishing the 1st round with no score. In the second round Tommy took bottom. He attempted many stand-ups that I was able to return him to the mat without giving up a score. Tommy attempted one more stand-up as time was running out in the round. I was losing control as Tommy turned back to face me. Rather than just cut him loose and give up the 1 point, I tried to maintain control and in doing so, I tripped and fell to my back with Tommy pouncing on top of me. I fought off my back as time expired in the round however; I was now done 4-0 heading into the final period. I took bottom. Tommy tried to beak me down but I kept in good position as I attempted to set up a Shrug. With about 30 seconds to go in the round I was able to hit a Shrug into a Peterson Roll putting Tommy on his back. I kept him there for a 4 count to earn a 2-point reversal and 2 point near fall to tie the score. One more count would have given me a 3-point near fall and the lead. With the score tied, I fought hard to keep Tommy on the mat as time expired in regulation with the score tied at 4. In over time we hand fought hard trying to score the winning take down. I then made an Ill-advised attempt at a throw that Tommy defended well ending up behind me for the winning score and the State Championship. I gave it my best and came up a little short. Great job Tommy for earning a good win. Now I’ll go back and train even harder and try to win the Greco Roman and Freestyle State Championships. Today I competed in the PCJWL Championships. Coming in as the # 2 seed from the district championships, I met the #3 seed from the other district in round 1. I was able to win the first match by scoring a reversal in the second period and holding my opponent scoreless throughout the match, except for a stalling point penalty I gave up at the end of the match. In round 2 I met the # 1 seed. I fought hard but was unable to come away with the victory. Now my goal changed to coming away with 3rd. In my next match I was able to win 3-1 putting me in the 3rd and 4th place match. My opponent would be Tanner B. I last met Tanner in the semi finals of state last year. 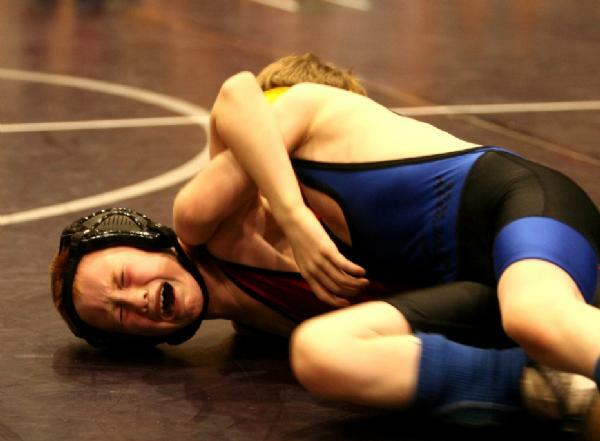 I lost 12-10 and Tanner went on to the finals where he won the state championship. I took my time and set up a nice throw putting Tanner on his back to take a 5-0 lead. I continued throughout the match applying the pressure and came away with a 13-4 victory to take 3rd place. 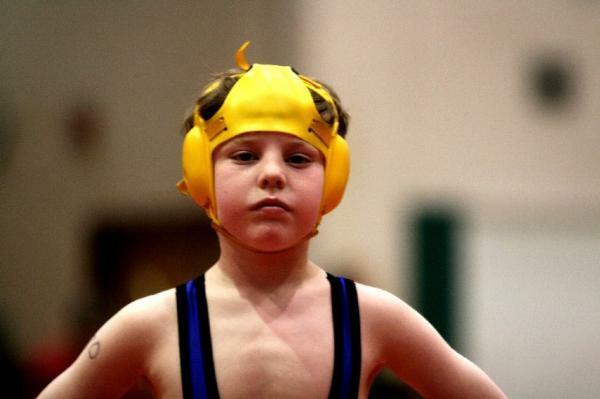 I was the only 9 year old to place in the top 4 of the 9 and over divisions of the PCJWL Championships. I ended the season with a 20-6 record. My losses came to 2-12 year olds, the PCJWL Champion and the runner-up. I now move on to my own age group instead of wresting kids 3 years older than me. I can’t wait. This week I took 2nd in the PCJWL Division Championships. In round 1 I got the win with a fall in the 2nd period. In round 2 I won a 4-0 decision to advance to the finals where I once again met Dalton M. I gave Dalton another good match but came up short. I move forward next week to the League championships as the # 2 seed. My record moves to 17-5 on the year. All of my losses to 12 year olds with 4 of my loses to Dalton. I am undefeated in my own USA age group. Today started the first leg of the PCJWL Championships. I was the #1 seed thus had a bye in the 1st round. In round 2 I scored an 8-6 victory to advance to the finals where I met Dalton once again. Dalton has give me 2 of my 3 losses on the year. I wrestled well but still came away with another loss to Dalton. Next week I move into the District Championships as a # 2 Seed. My record is now 15-4 on the year. Today I entered my 1st USA tournament of the year where I was able to wrestle kids my own age instead of up to two age groups above mine in the PCJWL. I had a good day going 4-0 to take 1st place. I scored two tech falls and a pin to reach the finals where I scored another fall in about 30 seconds to win the Gold Medal. With my 3rd win of the day today I registered my 200th victory in wrestling. My overall record improves to 14-3 on the year. This week I wrestled in a double dual. I wrestled varsity at 74 lbs. 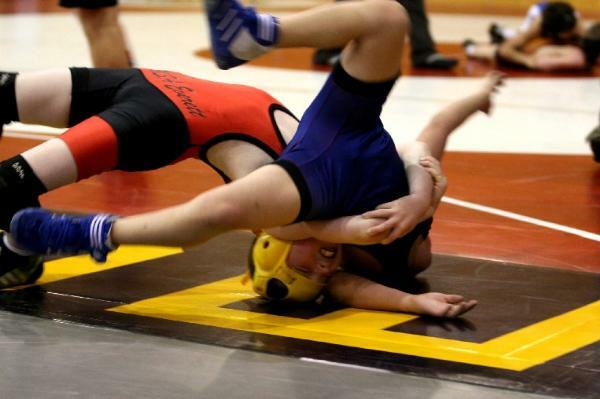 I won my first match with a Fall against White River and followed that with a 4-1 victory in my match against Orting. 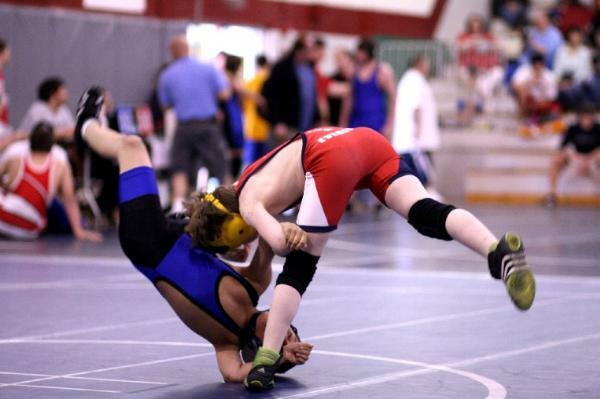 Today I wrestled in a PCJWL tournament in Maple Valley. 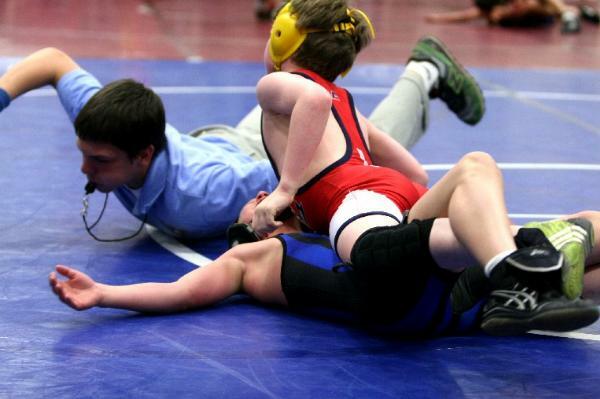 I wrestled 3- 12 year olds. I’m 9. I won all three of my matches without giving up a single point. I was able to get the first take down in each of my matches and then I was able to get away from each of my opponents when I was on the bottom and I held each of them down when they were on the bottom. 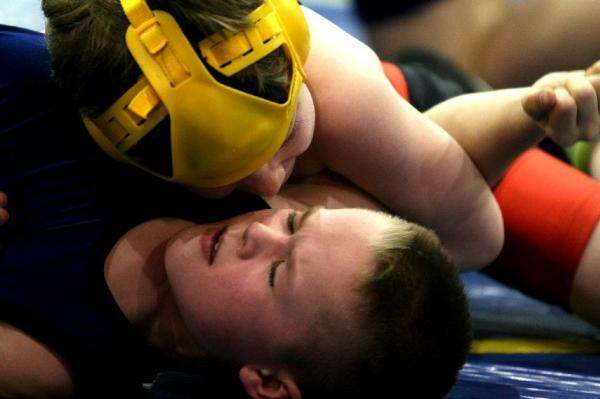 Last weekend I wrestled the PCJWL annual Tough guy tournament. 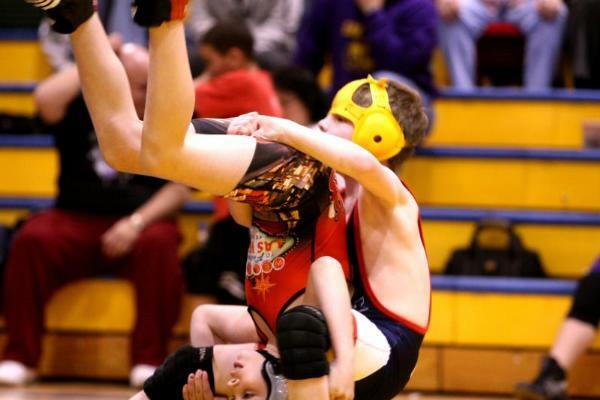 I again wrestled in the 12 year old division. After a bye in round 1, I went 2 and 2 on the day to take 5th place in a 25-man bracket wrestling 3 12 year olds and an 11 year old. I also wrestled in a Dual vs Kent last Saturday. I won my watch 12-2 wrestling as the varsity 73 lber. On the year my record is 6-2. Today I completed my 2nd straight undefeated freestyle season by winning the 2007 Freestyle State Championship to go along with my 2007 Greco Roman State Championship. This is my 4th Wrestling State Championship. I went 7-0 on the day scoring 1 fall and 5 tech falls as well as one decision win. In the finals I met Ben Knight who I had lost to in the Bronze medal match at Folkstyle State after having defeated him earlier in the day at Folkstyle State. This time it would be different in the Gold medal match as I won the match in two rounds by tech fall in each round without giving up a single point. I also defeated Ben earlier in the day as he was on my side of the bracket to finish the year 3-1 against him. While I was undefeated for the Freestyle & Greco Roman seasons,(42-0) I lost 4 matches during the Folkstyle season losing to 3 different wrestlers. I was able to avenge my losses to 2 of the wrestlers, Bo and Ben, but never got the chance to wrestle the 3rd again, Tanner, whom I lost to in the semi finals at Folkstyle State. I’ll have to wait 2 seasons to avenge that loss as Tanner moves up to the Novice division next year and I return as a Midget. I finished the season with a 68-4 record, 127-6 over the last 2 seasons. Today was the 1st year I could compete in the Greco Roman State Championships. I won my 1st Greco Roman State Championship by going undefeated and scoring tech falls and a pin in all of my bouts. 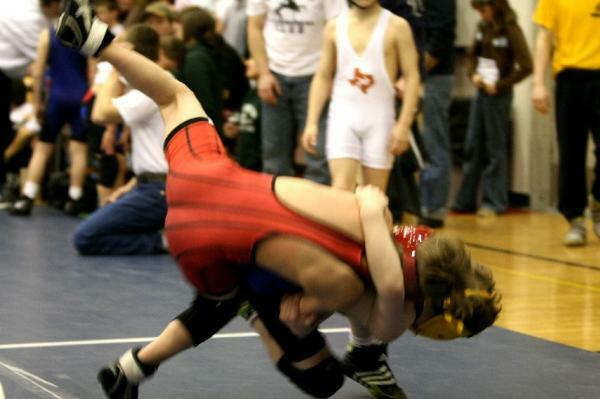 This was my 3rd State wrestling Championship, my 4th State Championship overall. 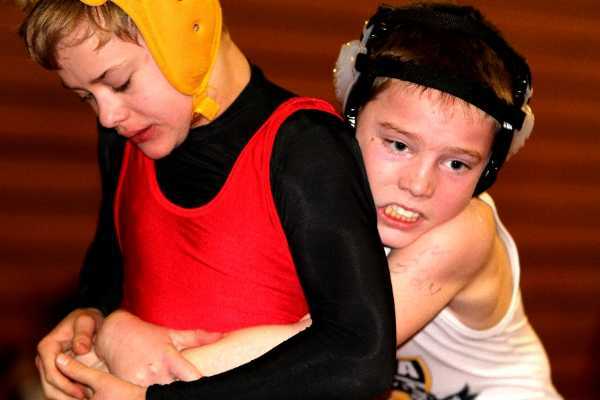 Today was the last regular season wrestling tournament. I finished out the freestyle/Greco season undefeated on the season by going 3-0 today to win 1st place. 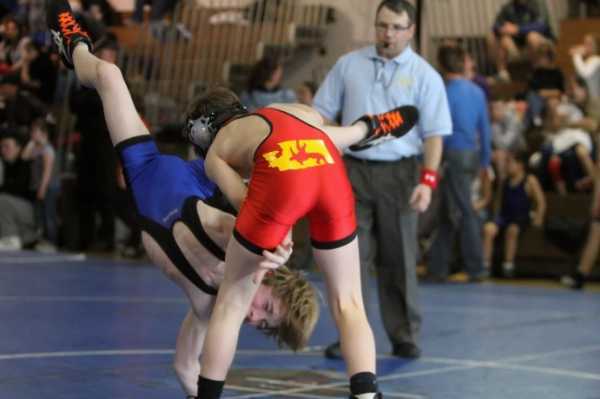 2 of my matches I won by fall and one by tech fall. I only gave up 1 point on the day. 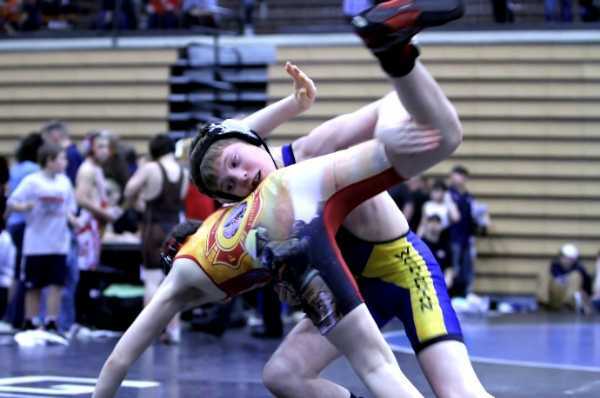 Next week is the Greco Roman State Championships followed by the Freestyle State Championships the following Saturday. My record improves to 57-4 on the year. This tournament today included both Freestyle and Greco competition. I went undefeated in both styles winning all 7 of my matches: 4 by tech fall, 2 by fall and 1 on points. This was my first tournament ever for Greco competition. It was a lot of fun. My season record improves to 55-4. For the Freestyle/Greco season I remain undefeated. I took 1st place again today winning the Steel Claw Classic. Three of my matches I won by tech fall and one by fall. 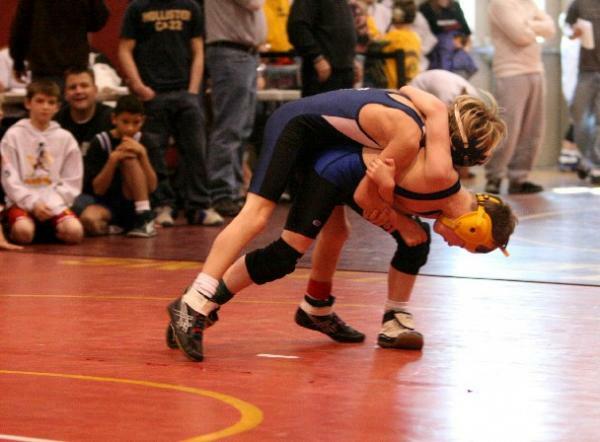 I didn’t give up any points in any match and improved to 48-4 on the season. I had a real tough day today. I did come away undefeated but it was hard. I went 5-0 on the day to improve to 44-4 on the year. In my 1st match I won in 2 rounds 8-3 and 7-3. In my 2nd match, I won round 1 7-3 then lost round 2, 1-5. It’s the 1st round I have lost in freestyle in 2 years. I injured my leg in this round, which took my out of my game a little bit for the rest of the day. I won another tough match in round 3 then had a much needed bye. In round 5 I met Bo. Bo is one of only 3 wrestlers to defeat me this year, and he did it twice in the same day during folkstyle season. Bo jumped out to a 4-0 lead in round one. I regrouped and scored the next 5 points to win the round. After making some adjustments on the break, I came out in round two to score a tech fall to win the match and move into the finals where I defeated Brady by fall. I had another 5 matches today all of which I won to improve to 39-4 on the season. I won 3 of my matches by tech fall, 1 by fall and one on points against Jake 5-1 and 7-1. I improved to 34-4 on the season today by going undefeated in route to taking the Gold Medal in my club’s yearly freestyle tournament. I scored tech falls in my first 3 matches placing me in the finals once again against my training partner Jake. Jake keep it real close today as I defeated him in two rounds by a score of 7-6 and 7-4. Saturday I competed in the 1st freestyle tournament of the season and came away with the Gold Medal. I scored a tech fall in my 1st match and registered a fall in my 2nd match. In my 3rd match I met my training partner Jake. We had another tough match in which I was able to come away with the victory in two rounds. Jake went on to take the Silver medal. In my final match of the day I scored a tech fall in 2 rounds. I was awarded the Outstanding Wrestler Award for the Midget Division and my brother Eric won it for the Novice Division. My record is now 30-4 on the year. Today I finished the folkstyle season by taking 4th place in the 2007 state championships, the highest a 1st year midget placed in my weight. Wrestling in a 32-man bracket, I received a bye in round one then won a 8-3 decision in round 2. In round three I had a tough match against Ben from the Basement Boys(Picture above). I was able to hang on for a 6-4 victory by scoring 2 takedowns and near fall points. In the semi finals I met Tanner Bloom. Tanner is a 2nd year midget and the favorite to win my bracket. I started slowly and fell behind 7-1 heading into the final period. Tanner chose down. My dad had me cut him loose giving him a point to make the score 8-1. I needed points. I was able to grab him and throw him for 2 plus hold him on his back for 2 back points. After giving up a reversal and trailing 10-5, I again threw Tanner for 2 to make the score 10-7 with about 20 seconds left in the match. Tanner was able to score another reversal for a 12-7 lead. I escaped on a stand up for 1 and threw Tanner a third time to make the score 12-10. With time running out and being unable to turn him, I cut him to allow him to his feet making the score 13-10. I went in for the throw hoping to score two plus earn some back points to win the match, but time ran out and I suffered a 13-10 defeat. Tanner went on to the finals where he won the state championships and I went to the consolation bracket where I won a 5-2 decision to move into the bronze medal match. There I met Ben from the Basement Boys once again. I was unable to come away with the victory this time and ended up taking 4th place. I finished the folkstyle season with a 26-4 record with my defeats coming to 3 different wrestlers, all of whom are 2nd year midgets and placed 1st, 2nd and 3rd at State. I wrestled the final regular season folkstyle tournament today. I went undefeated to win the Gold medal. 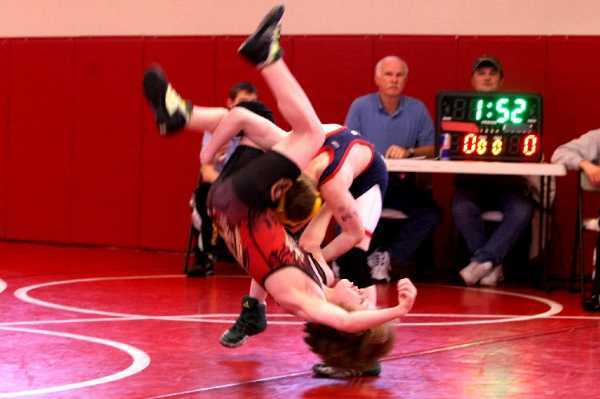 In my 1st match I scored a tech fall with a 12-0 victory over a kid from the Wildcats. I defeated my friend Harrison today 6-0 and once again met my training partner Jake in the finals where I won a hard fought 6-1 match. Next week is the State Championships in Spokane where I hope to win another State Championship. My season record is now 23-2. 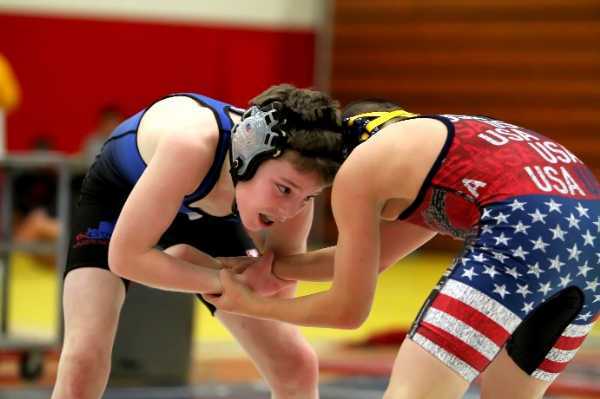 I won 6-0 in my 1st match today against a kid from the Yellow Jackets and followed up with a 9-0 victory in my 2nd match against a kid from Lake Stevens to put me in the finals where once again I met my training partner Jake. I took the early lead on Jake with a take down. It was a tough match with me holding on to a 1-point lead with about 20 seconds left in the match. Jake attempted a standup and as I threw him back to the mat, I dropped my hip to the mat as Jake executed a perfect switch for a reversal for 2 points. With seconds to go I was now trailing by a point. I dug down deep and got to my feet with a standup, hip heisted and executed a hip throw at the towel to score 2 points and eek out a 6-5 victory. That was close. Jake is a great training partner and always provides a tough match on Saturdays. My season record is now 20-2. I got back on the winning track today going Undefeated, 4-0, and winning the Gold Medal in the NWWC Oregon Classic Qualifier. I won my 1st match by tech fall, 11-0, 2nd by fall, 3rd by tech fall, 12-2, over my wrestling partner, Jake, and my final match by fall over my football teammate, Harrison. My record is now 17-2 on the season. Well I lost my first match of the year today. It was the 1st defeat I have suffered since Jan of 06 after 35 straight wins. I lost to a second year midget, Bo; I’m a 1st year midget. I wrestled Bo twice. The 1st time, I lost 7-1 in the 2nd match of the day. I then won my way trough the losers bracket and faced Bo for 3rd/4th Place. I wrestled him tough again but came up short losing 7-2. I did win my other 4 matches today: 10-0, 5-0, 10-0 and 2-0. My record for the year is now 13-2. Today I won the Gold medal in the NW Holiday Folkstyle Championships. I went 3-0 on the day scoring 1 fall, 1 tech fall and a 9-2 victory to improve to 9-0 on the year. 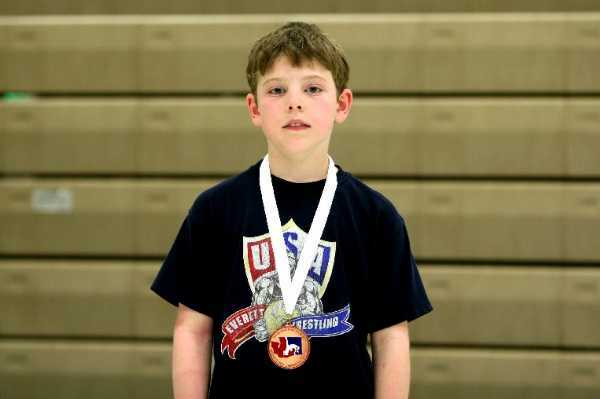 I wrestled in the PCJWL Tough Guy Tournament today winning the Gold medal in the 8 and under 70lb division. I was the top seed in the tournament so I received a bye in round 1. I scored a fall in round two then met my training partner Jake in round 3. I was able to win a close 2-0 decision that put me in the finals. In the finals I met a tough wrestler named Coco Ybarra from White River. I scored a take down in the 1st period to take a 2-0 lead. I was unable to score in the 2nd period and gave up a reversal with 1 second to go in the 3rd period allowing Coco to tie the score at 2-2. In OT, I worked my way in by hand fighting then shot a blast double lifting Coco (above Photo) and driving him into the mat to score a takedown for 2 and securing the win. Coco was the toughest match I’ve had so far this season. 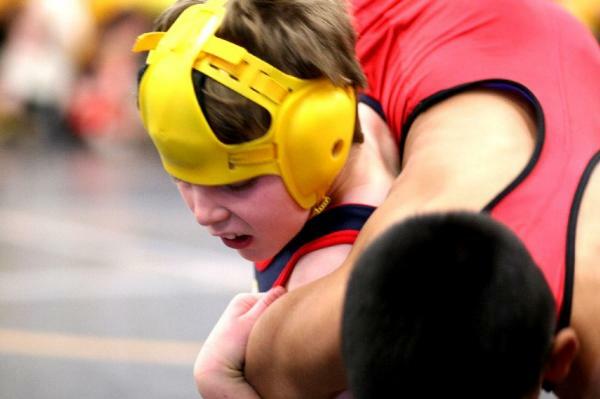 I look forward to wrestling him again at the State Championships. My season record is now 6-0. I wrestled my first folkstyle tournament of the season today. I took 1st place by winning all three of my matches, one by fall and two by tech fall. 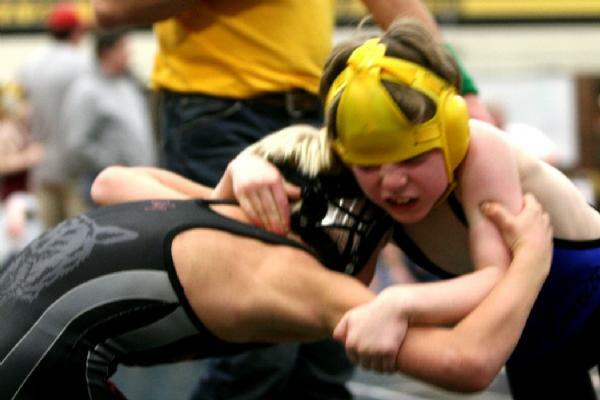 In my 1st match I wrestled my friend Harrison who I play with on the Bulldawgs. I was able to defeat him by a 14-3 tech fall. In round two, I wrestled one of my training partners, Jake, and won that match 11-0. In the finals, a scored a fall in 45 seconds to take 1st place. My season record is 3-0. Click here for MY previous Wrestling years.